At the University of Southern California (USC), in the lobby of the Doheny Library, a giant story of Jewish history has been writ large in a small exhibition titled "Lives of the Great Patriotic War: The Untold Story of Soviet Jewish Soldiers in the Red Army during WWII." On display through July, it contains just 10 kiosks, including two multimedia displays with snippets of a new video archive. In Russia and throughout the former Soviet Union, World War II is referred to as "The Great Patriotic War." 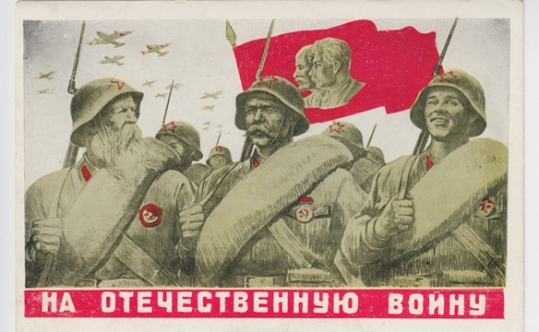 More than 30 million Soviet citizens served in the war, and more than 8 million died. Soviet casualties from the war have been estimated at more than 26 million, a deep wound in the Soviet national consciousness that touched every family and every citizen. Until now, little attention has been paid to the 500,000 Jews who fought the Nazis as part of the Red Army, more than 160,000 of whom received medals for their bravery and their service. Until now, the stories of those Soviet-Jewish soldiers have been absent from Holocaust archives, memorial museums, survivor testimonies and historical accounts. This exhibition is part of an effort by the New York-based Blavatnik Archive Foundation to change all that. Established in 2005, the Blavatnik Archive Foundation was funded by the Blavatnik Family Foundation of Len Blavatnik and his brother Alex, Jews born in Odessa who immigrated to the United States in 1978 and whose successful company, Access Industries, has investments in oil and petrochemicals, as well as media and real estate, including the 2011 purchase of the Warner Music Group. Julie Chervinsky, director of the Blavatnik Archive, explained in a recent phone interview that the archive includes a collection of Judaica, historical materials, ephemera and posters. Also in the collection are many letters from the front during the war that gave great insight into the personal dramas of Jewish soldiers fighting in Soviet territory -- a chapter of Jewish history that, Chervinsky said, "had not been captured at all." Collecting the testimonies of Soviet-Jewish participants in World War II became the archive's mission and its priority. Although by the time its research began, many of the survivors had died or were quite old, yet more than 1,100 survivors currently living in 11 countries have been interviewed. This exhibition is assembled from those testimonies. Organized both thematically and chronologically, the exhibition describes each phase of the war in both English and Russian texts, through personal photos of the survivors (then and now), as well as propaganda posters and postcards. It tells of the role of Jews in the first Soviet generation, who were also witnesses to and participants in the Russian Revolution. It shows how they felt on the eve of the war against the Germans, and how Russia stoked fear with propaganda films, such as the 1938 "Professor Mamlock," which is one of the first films to address Nazi anti-Semitism. Boris Tsalik speaks of his "love of the motherland," which led him to volunteer for the Red Army. Abram Byakher recalls that the longest day of 1941 was June 22, the night of his high-school prom -- and the night Germany invaded Russia. Hitler's "Operation Barbarossa," the invasion of Russia, was very successful at first. By mid-July 1941, the Germans had moved more than 200 miles inside Russia, and some 4 million Soviets had been captured or killed. It was then that the Soviets made a strategic decision, as shown here, to evacuate, forcing a retreat by some 16 million Soviet citizens. As the Germans advanced farther and farther away from their supply lines, only to find little to no resources on the ground, they became overextended, leaving an opening for the Soviet counteroffensive to launch. At Stalingrad, Soviets were ordered to cede "not a step back!" Under Stalin's orders, the Red Army used its infantry and tank units to turn the tide of the war. The exhibition features Alexandra Bochalova, Igor Blinchik and Ida Ferrer, some of the Soviet Jews who fought there. According to the Blavatnik Archive, another 20,000 to 30,000 Jewish partisans also fought the Nazis on Soviet soil, helping to liberate Russian territory, as well as Poland, Hungary and eventually fighting all the way to Berlin. Mark Altshuller was among the Soviet troops who liberated the Majdanek concentration camp. He recalls seeing barracks full of children's hair, shoes and other belongings, the corpses barely incinerated. The sight filled the troops with such rage, they began to execute the remaining German officers on the spot and continued to do so until Stalin ordered them to stop. There is something both heroic and tragic about the Jewish experience in the Soviet Union. For many Jews in that first generation of revolutionaries, the Soviet Union not only afforded greater rights and the social mobility to leave the shtetls and ghettos of provincial life, it also offered opportunities for education and to pursue professions previously denied to Jews. In return, however, those Soviet Jews had to give up religious observance; being Jewish became merely an ethnic nationality. Then, under Stalin, Jews became doubly cursed: They could not practice their religion, and being identified as Jewish on official documents nevertheless led to discrimination and distrust. It is heartbreaking to read of Jews who fought at Stalingrad and yet whose hope of a transformed Russia were dashed when they returned home to find their patriotism doubted, their homes and possessions looted, and anti-Semitism officially sanctioned. I know this truth firsthand from my relative Michael Sherwood, born Meyer ("Misha") Teichholz in Tarnopol, in what was then Poland, who lived this history. When the Germans invaded, he fled to the Soviet Union, and though he was just a teenager, he joined the Red Army and served at Stalingrad. Then he was arrested and sent to the gulag (which probably saved his life) simply for the crime of being a Jew. In 1947, the Soviet officials repealed their decision and released him. He made his way back to Poland, where the Jewish population had been liquidated. He emigrated to Israel, and then to New York, where he lives today. He calls himself a "double survivor," having survived the Holocaust and the gulag -- but because he fled to Russia, he was not considered a Holocaust survivor by the European Holocaust organizations; and the United States' organizations looked askance at the fact that he'd served in the Red Army before being falsely imprisoned in the gulag. A few years ago, I was able to help him publish his story, "Odyssey," which is available in print versions and as a free e-book download from lulu.com. Chervinsky told me one of the most gratifying aspects of the Blavatnik Archive's work comes from the survivors' gratitude that "somebody came and listened to them and treated them professionally." In short, what makes this so meaningful, Chervinsky said, is their "response to not being forgotten." Which is why after seeing this exhibition, I put Sherwood in touch with the archive, so that my own relative's knowledge of the Jewish experience during World War II can be expanded to include the experiences of those ignored for so long, those Jewish heroes of "The Great Patriotic War."